The HCBA is a voluntary not-for-profit association of lawyers and judges in Hartford County, dedicated to promoting public service and furthering the principles of law and justice. 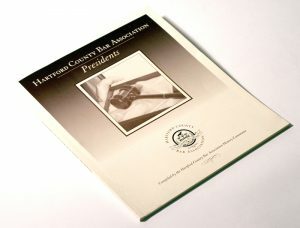 2008 marked the 225th anniversary of the Hartford County Bar Association. A celebration dinner was held on December 8, 2008 at The Marriott Hartford Downtown. Over 300 members were in attendance. The program was hosted by the organization’s president, Kathryn Calibey and United States Senator Christopher J. Dodd gave the Keynote Address. The culmination of the event was a special tribute to the organization’s past presidents. 1996-1997 James G. Green, Jr.
2002-2003 John C. Matulis, Jr.
2005-2006 Dennis J. Kerrigan, Jr. In honor of the Association’s 225th Anniversary, the History Committee compiled an overview of the individuals who have served as president from 1886 through 2008. The publication contains biographical sketches of the deceased presidents and quotes from contemporary presidents. The biographical sketches were compiled with information available from the Hartford County Bar Association records, newspaper articles and obituaries, historical references and internet sources. If you are an HCBA Member and are interested in obtaining a copy of this publication, please contact the HCBA office at (860) 525-8106.